Concrete Moisture and Alkalinity Testing is an essential part of determining the suitability of a concrete slab to receive a moisture-sensitive floor covering. These tests should be performed on all concrete slabs regardless of their age or grade level. Many U.S. manufacturers of resinous coatings, adhesives, and floor coverings specify testing for the Moisture Vapor Emission Rate (MVER) of a concrete floor slab and/or the Relative Humidity (RH) in concrete floor slabs to determine if the dryness and moisture content is suitable to install their products. The American Society for Testing and Materials (ASTM) has published a set of standards for the moisture testing of concrete. ASTM F1869-04 Standard Test Method for Measuring Moisture Vapor Emission Rate of Concrete Subfloor Using Anhydrous Calcium Chloride. ASTM F2170-02 Test Method for Determining Relative Humidity in Concrete Floor Slabs Using In-Situ Probes. ASTM F2420-05 Standard Test Method for Determining Relative Humidity on the Surface of Concrete Floor Slabs Using Relative Humidity Probe Measurement and Insulated Hood. ASTM F710-03 Standard Practice for Preparing Concrete Floors to Receive Resilient Flooring makes some recommendations about the suitability of installing resilient floor coverings on a concrete slab based on the results observed through these test methods. This standard says that moisture vapor emission, per ASTM F1869, should not go over 3 pounds per 1,000 sq. ft. per day, except in cases otherwise specified by the adhesive or flooring manufacturer. The standard goes on to state that relative internal humidity of a concrete slab shouldn’t go over 75%, per ASTM F2170, unless otherwise declared by the flooring or adhesive manufacturer. Moisture within concrete slabs is so prone to movement when temperature and humidity change, so testing for both moisture content and moisture emission vapor pressure is strongly recommended. It should be noted that any testing method has limitations and can NOT offer a guarantee of a long-term successful floor covering installation. No test can reveal everything that should be considered when making a decision about the installation of a floor covering/coating. Test results can only indicate a snapshot of the slab condition at a particular spot at the time of testing. Moisture vapor emissions are subject to seasonal fluctuations and any subsequent damages are beyond the control of the testing agency and the installation contractor. Changes in the interior environment subsequent to testing may cause conditions to change and lead to flooring failures. It should be noted before we discuss some of these individual testing methods – that under certain conditions many test methods can be fooled. For example, when a design involving a concrete mix with a very high water/cement ratio, or even a highly porous concrete, is set without taking advantage of the protection of a sub-slab vapor barrier – an effective one, the vapor emission and moisture content of the concrete can vary dramatically based on changing conditions such as seasons. Studies have been published that show an effect of installing floor coverings with small amounts of permeability is that of boosting the moisture content of the concrete, when a sub-slab moisture source exists. An example is where a warehouse area is converted to office space. MVER testing performed discovered that the results of the test happened to meet the criteria laid out by the manufacturer of the selected floor covering so a new floor was installed. Not long after installation, either the adhesive system or the flooring itself failed and subsequently new tests were performed. These new tests revealed levels of moisture vapor emission far exceeding the original test results and the inevitable blaming and finger pointing followed. Generally, the concrete surface in the open warehouse had in fact dried sufficiently to show levels of moisture vapor emission that were indeed low enough as to pass any standards of the floor covering manufacturer. After the concrete subfloor is covered, concrete moisture content can start to elevate and can create a catastrophic failure of the floor covering system. The in-situ relative humidity test can, in many instances, detect this problem. This problem can also be seen when carpeting and carpet pads are replaced with different flooring products such as sheet vinyl or wood flooring. 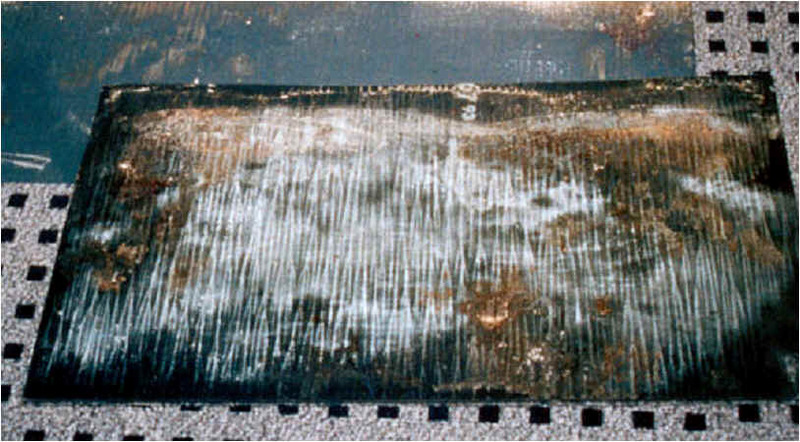 To this point we have yet to see the same difficulty when testing with in-situ relative humidity probes, but still there should generally be careful concern and attention paid when coating or covering a concrete slab that isn’t protected by a tried and true sub-slab vapor retarding membrane. Many manufacturers of floor covering products even specifically demand the use of a sub-slab concrete vapor retarder underneath slab-on-grade concrete when their products are to be used. The Anhydrous Calcium Chloride (CaCl2) Moisture Vapor Emission Test has been developed to quantify, in a meaningful way, the amount of moisture vapor emission from a concrete slab. ASTM F1869-04 is the most current edition of this testing protocol. This test measures the amount of moisture absorbed by the calcium chloride, over a known area of concrete (dome area), over a known period of time (60-72 hours). The test is performed by placing a quantity of calcium chloride in an open dish and placing the dish on a clean, abraded concrete surface. The dish is covered by a dome of approximately 9″ x 9″ and 2″ in height. This dome is sealed to the concrete to prevent normal humidity in the room from affecting the test. The test apparatus is left undisturbed for a period of from 60 to 72 hours. At the end of the test period, the dish is retrieved and any weight gain of the dish is attributed to moisture leaving the concrete and being absorbed by the calcium chloride. A mathematical formula converts this data to a result providing the number of pounds of moisture vapor emissions per 1000 square feet per 24 hour period. 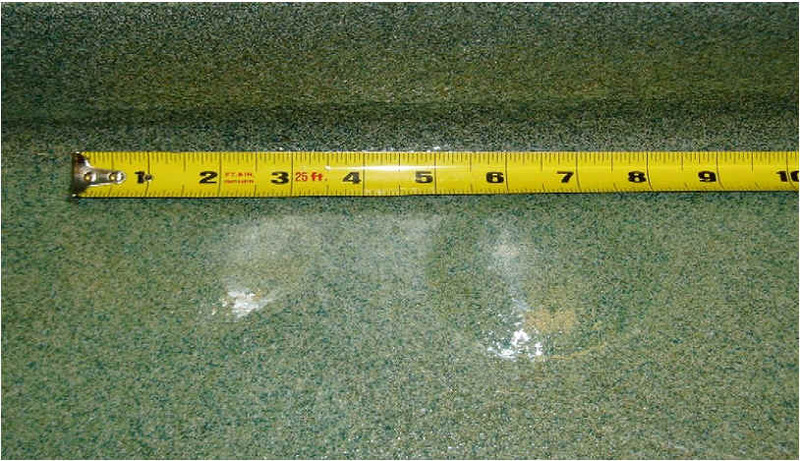 Calcium chloride testing results are generally accepted by the majority of U.S. floor covering manufacturers, as well as producers of adhesive and resinous coating products, as the benchmark for concrete moisture levels (or lack thereof) and suitability for the installation of their flooring and adhesive products. As noted above ASTM F710 states that concrete is suitably dry only when vapor emission is less than 3 lbs. of water per 1,000 sq. ft. per 24 hours, when tested in accordance with test method ASTM F1869-04. The testing density is required to equal 3 tests for the first 1,000 sq. ft., with one additional test for each additional 1,000 sq. ft. of concrete slab surface. The building project in question must be acclimated near the relative humidity levels and ambient temperature that is anticipated to occur during occupancy or use. For obvious reasons this can be a difficult requirement for a new construction project to meet. If these conditions cannot be met, the ASTM standard offers tolerances which, at a minimum, should be honored if accurate test results are anticipated. If the HVAC system cannot be made operational at the time of testing a recording hygrometer should be used to record and monitor humidity levels and ambient temperature for the purposes of comparison to expected occupancy conditions. Significant variance between the test environmental conditions and intended use environment can result in unreliable or erroneous test data. As discussed in the about moisture section, the vapor pressure differential, created by temperature and humidity have a direct controlling influence on moisture vapor movement. Concrete surface moisture vapor emission is reflected by the Calcium chloride tests. Suggestions have been made that indicate the test reflects moisture in the top 3/4 inch of the slab’s thickness with 90% of the measured MVER coming from the top 1/2 inch of the slab. If environmental conditions immediately before testing were extremely wet or dry, the test results may be skewed accordingly because the concrete surface may have been affected. Performing tests on a “breathing”, or open, concrete surface can sometimes fail to reflect moisture that is contained deep within or even directly below the concrete slab. Once covered by low permeability floor coverings, moisture content of the concrete will eventually become equal throughout the thickness of the slab. This could indicate that a larger amount of moisture will be present at the floor covering/concrete interface following installation than was originally expected. Surface contaminants and residue from paint, adhesive, curing or parting compounds create inaccurate test results by reducing vapor emission at the test site. Many penetrating cure and seal products or penetrating parting compounds (tilt-up construction) can sometimes be hard to detect and even more difficult to remove. They nearly stop moisture release and can end up reducing test results for vapor emissions. In the experience of this writer, some of these products have the potential to slowly degrade over time which will lead to latent moisture release from the concrete slab and eventually the floor covering system will fail. This test method has been used extensively in Europe and after side-by-side testing with calcium chloride kits. Our agency believes that the In-Situ RH data is more useful and meaningful than calcium chloride test results although both test methods are recommended since they provide different data. The ASTM standard for in-situ RH testing is designated F2170-02 and closely follows the procedures used in Europe. Our field experience dictates that in-situ probes for the testing of slab-on-grade concrete offer results, which are less impacted by relative humidity conditions and ambient temperature than the calcium chloride test. This generates meaningful data under conditions that may not be acceptable for calcium chloride testing. By being in contact with the earth, concrete slabs are a heat sink and as such, their internal temperature is affected by both temperature of the air space above and the sub-slab soil temperature. In contrast, the internal temperature of suspended concrete will be affected only by the temperature of the air space above and below the slab. It must be noted that ASTM F2170 states that slabs, which are to be tested should be “at service temperature and the occupied air space above the floor slab shall be at service temperature and service relative humidity for at least 48 hours before making relative humidity measurements in the concrete slab.” Testing density is required to equal 3 tests in the first 1,000 square feet, with one additional test per each additional 1,000 square feet of concrete slab surface. The test standard requires drilling holes to a depth equal to 40% of the slab’s thickness. The hole is then lined with a plastic sleeve and the sleeve is capped. The test site must be permitted to equalize for 72 hours prior to reading relative humidity levels. After or during acclimation or equilibration, a probe is placed in the sleeve that permits readings to be obtained from the bottom of the hole, thereby offering a method to measure moisture content inside of the concrete slab reported as a relative humidity level. By performing tests at multiple depths a testing agency is permitted to develop a profile of moisture conditions that extends all the way through the entire thickness of a slab of concrete. By having this information, a user is allowed to make a more informed decision in regards to installing floor coverings or the need to consider other concrete protection alternatives. It is critically important that probe temperature is at equilibration with concrete slab temperature. Testing should take place in an acclimated building and at the same density as noted above. This test method is less subject to conditions occurring at the concrete surface that may influence calcium chloride test results. Less impactful on test results is the type of, or lack of, floor coverings in place prior to testing. Most resilient floor covering manufacturers recognize ASTM F710-03, which states in Section 5.2.2 “In accordance with Test Method ASTM F2170, the relative humidity in a concrete floor slab shall not exceed 75% at the time of testing, unless otherwise specified by the flooring or adhesive manufacturer.” A listing of manufactures who have adopted the ASTM F2170 test method in their specifications that our agency is aware of can be found here. 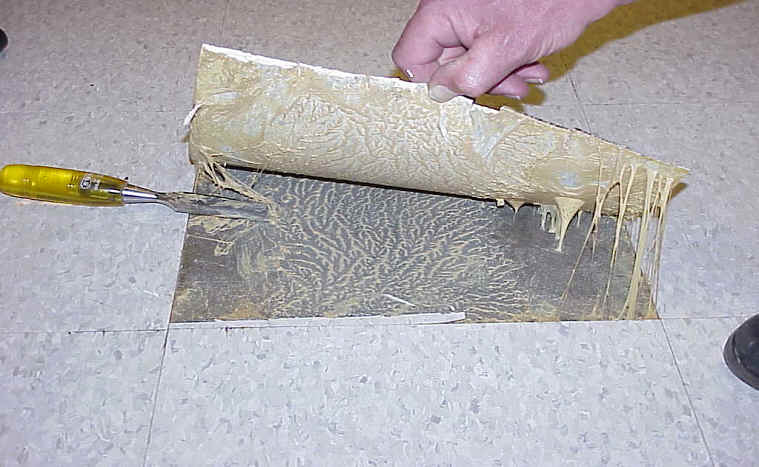 The flooring industry is noticing data developed by testing agencies that are not following the ASTM F2170 protocol, especially in regards to the acclimation of the test probe and the test probe. Without the equilibration of the test site temperature and the test apparatus temperature, the data generated could be inaccurately skewed high or low in relation to the direction of inequity, thus returning data that is misleading. Our testing agency uses equipment from various manufactures to perform testing in accordance to ASTM F2170 standards. This allows us to provide our clients with a diversity of technology to perform testing. Our equipment includes testing instruments that allow us to provide not only snapshot readings but also automated data logging of in-slab relative humidity and temperature trend recordings. A new testing method to the U.S. is the insulated hood relative humidity method which like the in-situ relative humidity method, has been previously used in Europe. The ASTM F2170 and F2420 both measure the equilibrium relative humidity. The hood method measures close to the surface and humidity probe tests measure at the 40 percent depth of the concrete. Readings from the hood method tend to be five percent lower than with the sleeve method. The hood method measures the amount of free water in the concrete and the calcium chloride kit measures how much vapor is being driven off the surface. One of the reasons humidity testing in concrete is becoming more popular is that these methods are not as sensitive to atmospheric conditions unlike the calcium chloride test kits. The hood method is measuring the equilibrium relative humidity of the concrete in exactly the same way ASTM F2170 is and is gaining popularity due to the fact no drilling is required. The hood test consists of securing an air tight box to a bare concrete surface and the relative humidity within the box is obtained through a probe which is inserted into the box. Like with the other moisture tests, the occupied air space above the floor slab shall be at service temperature and service relative humidity for at least 48 hours before making relative humidity measurements. This method is very good for those situations where drilling may not be advisable. Testing for alkalinity is often overlooked but of extreme importance to a successful installation and like with moisture testing, it should be conducted on all floor regardless of the grade or age. pH is a measurement of hydrogen ion concentration that indicates the acidity or alkalinity (basic) of a solution. ASTM F710 states that the surface of a concrete slab should be free of alkaline salts, and excessive carbonation or laitance. ASTM F710 also states that a pH test shall be taken at every location and at each time a moisture test is performed. The slab surface should be tested with a maximum pH reading of 9 or the resilient flooring and adhesive manufacturer’s recommendations. Our agency performs pH testing using both electronic pH meters and litmus paper. Prior to selecting test methods for any given project, it is recommended that the manufacturer(s) of floor coverings, coatings and adhesives selected for the project be contacted. In order to protect warranty rights, their specifications regarding acceptable test methods for determining suitability and dryness of a concrete slab should be followed. Too often a decision to install floor coverings or coatings is based on poor information or the simple demand to meet a schedule. If a concrete substrate has a moisture vapor emission level, in-situ relative humidity, or a pH level in excess of that which can be tolerated by the flooring material, the losses are rarely limited to the flooring itself. The tenant may end up, at best, with an eyesore, at worst there may be a trip or slip and fall hazard with dire financial consequences. The need to vacate a floor after move-in, while repairs are made, can be extremely costly and for many industries the loss of revenues can exceed the value of the floor by a vast magnitude. It is the opinion of this agency that a combination of these tests, performed concurrently in a subject building, offers the greatest depth of data in decisions that may be made based on such data, followed up with a reasonable strategy that includes concrete waterproofing products such as Spray-Lock SCP 327.